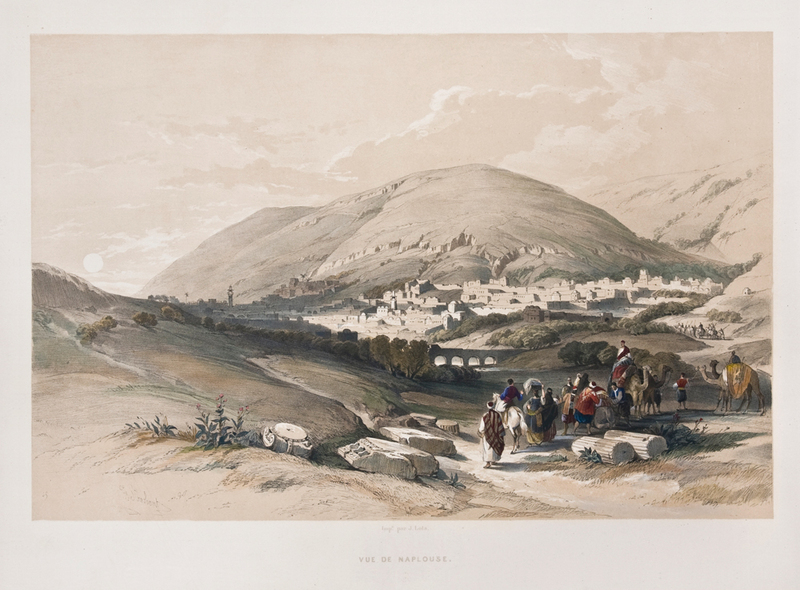 Nablus, one of the largest Palestinian cities in the West Bank and an important commercial and cultural center, was shaped over generations of contact with multiple empires and states, and through the interactions between the city’s urban dwellers and the residents of villages in Jabal Nablus (Mt. Nablus) region that constituted its rural hinterland. Nablus is named for the ancient Roman City, FlaviaNeopolis, founded in the year 72, C.E. It was identified with the nearby Canaanite city of Shechem. Archaeological evidence of Shechem as a Canaanite city goes back 4000 years. In 636, when Nablus came under the rule of the Islamic Arab caliphate Umar Ibn al-Khattab, its Latin name was Arabized to Nablus. After being under Crusader rule for most of the 12th century, Saladin’s forces took control and reestablished the Islamic rule. After it came under the Ottoman rule in 1516, Nablus became the capital of Jabal Nablus (Mount Nablus) district, and Nablus was ruled by a succession of local rulers. 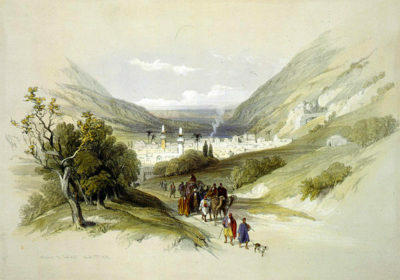 With greater Ottoman centralization, Nablus was administered by Damascus, and later Beirut, and so was often oriented northward, within the larger region regarded as Greater Syria. However, it was also a center of its own for the many villages in the area. In the 18th and 19th centuries, Nablus was best known for its export of olive oil soap to markets around the Middle East. During World War I, British forces captured Nablus and the city became part of the British Mandate for Palestine in 1922. In 1948, the city was captured by Jordan and annexed it along with the rest of the West Bank. In 1967 Israeli forces captured the city and held it under full Israeli military occupation until transferring governance to the Palestinian National Authority as part of the Oslo Peace Accords in 1993. While the core of urban Nablus is now considered part of “Area A,” under Palestinian Authority governance and security control but broader Israeli oversight in practice, many parts of the larger, rural Jabal Nablus region are under partial or full Israeli control, and several Israeli Jewish settlements and outposts are located in the vicinity. Nablus was known before Islam as the city of Samaritans, who follow the Five Books of Moses (the Torah). They are descendants of Ephraim son of Joseph and, therefore, sanctify Joseph’s Tomb and Mount Gerizim (Jabal Al-Tur in Arabic) where they hold their prayers. Because of differing beliefs, they have no connection to rabbinic Judaism, even while following the same holy books. After the Islamic conquest in the 7th century AD, Samaritans continued to live in the city with Muslims. In the 12th century AD, their population reached one thousand persons. Shechem and Nablus, being home to the tomb of Joseph, gained great importance that reached the point of sanctification for Christians as well. Particularly because of the biblical story when Jesus Christ stopped by the Well of Prophet Jacob and asked a Samaritan woman for a drink of water. As they sat by the tree that Jacob had planted, he gave her his advice and exhortations. During the 4th century, and because of the religious status given by Christians to this place, Empress Helena ordered a monastery to be built above the Well. During the same century, the monastery was turned into a church and visited by Saint Jerome. Another reason for Christians’ interest in Nablus is their belief that St. Justin the Martyr was born there in the year 100 AD. During the 5th century, the Byzantine emperor Zeno expelled the Samaritans from Gerizim and built a church. Later, Emperor Justinian built 5 more churches in Nablus. Throughout the Islamic rule of the city, and especially during the Ottoman period, Muslims were interested in the restoration of many Christian churches. After Palestine came under the rule of the Islamic , Neapolis was ‘Arabicized’ to Nablus, and many of its churches and Samaritan synagogues gradually converted into mosques. In 1099, the Crusaders took control of the city for less than a century, leaving its mixed Muslim, Christian and Samaritan population relatively undisturbed. Islamic rule was reestablished after 1187 and continued under the Mamluk and Ottoman empires to follow. In 1909 the number of Christians in the city was 715, the Samaritans 160, the Muslims 10186. Today, the city’s population is predominantly Muslim, with Christian and Samaritan minorities and the three religious groups live in peace and harmony alongside each other.